Mr. Oscar Udeshi was born in the former British colony of Hong Kong. He read economics and philosophy at the London School of Economics before embarking on a career as a banker. Whilst working in the city, Mr. Udeshi constantly searched for clothes that would make up his ideal wardrobe. Unable to find them, he had all his clothes made to his designs and specification. To fill the void that was missing in traditional tailored clothing, Mr. Udeshi left finance and trained under one of the last remaining bespoke shirt makers of Jermyn Street. The label UDESHI was founded in 1999. In the Autumn of 2000, Mr. Udeshi introduced a now signature product – the extreme cutaway collar shirt. Some months later, Mr. Udeshi was invited as a ‘rising star’ designer to Pitti Umo, Florence, the world’s most prestigious menswear show. Collections followed in renowned department stores such as Takashimaya New York, Browns, Harrods London and Isetan Tokyo. In the Summer of 2002, Mr. Udeshi became the youngest menswear designer to be on the official calendar of the Federation de la Couture during Paris Men’s Fashion Week. A year later, Mr. Udeshi was invited back to Paris to present a fashion show hosted by Ambassador Sir John Holmes at the British Ambassador’s Residence. UDESHI became a member of the British Menswear Guild in 2004. 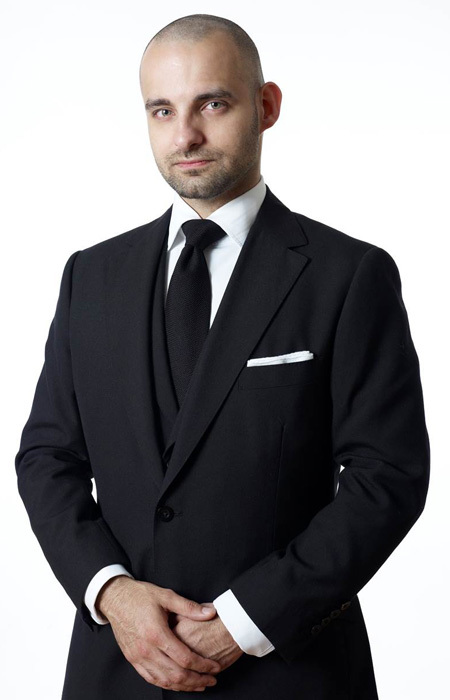 Two years later, Mr. Udeshi became the youngest elected Vice Chairman of the British Menswear Guild, and in 2008, became the youngest elected Chairman. Mr. Udeshi became a board member of the UK Textile and Fashion Association in 2009 and writes regular columns on the menswear industry. What advice do you give clients when they first walk in your store looking for a bespoke suit? To look and feel your best, it is a journey. Their body, posture and personality will be analysed, their weak points minimised, their strengths accentuated, and hopefully their life simplified. It is an investment in terms of time, and finance, and not a process for someone who has little patience – that is what made to measure is for. Once the pattern is perfect, and the client doesn’t change his shape, multiples can be easily made, but it is a process before one gets there. On the plus side, it allows a client to express his true personality, aesthetic and values. He will have a truly unique product made especially for his body and his exacting requirements. Where are the important fitting points of a suit? Does it fit, do you feel comfortable in it, can you move in it the way you want to move, does it make you look and feel great. What do men want to achieve when buying a bespoke suit? I would say an item of clothing that fits them perfectly, not just in fit, but in style, cloth and that makes them look the best that they can possibly look. As it is bespoke, almost everything is possible. It is not a function of looking at a rack and making do with the off the rack suit that has the least problems, or least negatives. Are all suits created equal? No they most certainly are not. They come in so many variations, just like humans. Even if a tailor was to make two identical suits for the same person in the same cloth at the same time, they would probably feel different. As soon as handwork is involved, and cloth not being static like an ingot of aluminium, one can have variations. Just because a suit is more expensive, or has more hours of hand stitching, this does not necessarily make a better suit. It has to fit the wearer, and he has to feel comfortable in it. Even if a suit is technically perfect, if the wearer feels uncomfortable in it, it is not perfect. How many suits should a man have in his closet? Any particular colors? Style? A man should have a suit for every working day of the week for a given season. So in Continental Europe, that is five fall / winter and the same again for spring / summer, plus a more casual suit for each season, a dinner suit, and if required, white tie and morning suit. In places that do not have a big difference in temperature during the year, or there is just one season, then 8 to 10 suits would be the minimum. Some may consider having so many suits wasteful or decadent. I look at it as a wise investment. With more suits, each one will be worn less and thus last longer. The style and colour of the suit should reflect the character of the wearer, his preferences and his needs. Certain body shapes work better in some styles than others, certain fabrics can make the wearer look younger or older, depending on his colouration and physique. Certain colours are inappropriate for certain professions. If one had to generalize, a plain navy suit and a charcoal suit cut in single breasted styles should be found in every suit wearer’s wardrobe. What do you emphasize for a suit? That suit has to look, feel and fit great. All three elements have to be present. If the suit looks great but is too tight and uncomfortable for the wearer, he won’t like wearing it. Our house style is an English aesthetic, which in my opinion looks athletic and powerful, but with a softer Italian like construction, so that one has the look, but also comfort, and not a stiff heavy suit of armour. We achieve this with lighter canvas and interlinings, thinner shoulder pads or none at all and lighter fabrics. Can a man have a suit for sexual allure? Power Allure? Definitely. One only has to think of the film Wall Street. A well fitting suit on the right body, in the right fabric can denote power, wealth and sexual appeal. Can anyone look great in a tailored suit? No, there are limits, we are not magicians after all. If you are out of shape, over weight and have a horrible posture, a tailored suit will just make you look like an out of shape, over weight man wearing a tailored suit. You will look better than before, but not great. A good suit will make you care more about your appearance and possibly make you stand taller and stride more confidently. How should a man put together his look? Start with what you have least of, and can’t change, so usually the suit. Then pair a shirt and tie with it. Once you have decided that, move on to the shoes and leather accessories (so if you are wearing black shoes, get a matching or complimentary black belt, wallet etc.). The additional elements, the shirts and ties etc should be at the same level of formality as the rest of the outfit, or if you are an aspiring satorialist – the complete opposite. For the average man, a formal suit requires a formal shirt, thus for a formal double breasted chalkstripe suit, one should not pair it with a dark button down shirt with a whimsical tie.